JUBA– The President of South Sudan Salva Kiir has issued a decree offering a blanket amnesty to rebels, including his Vice President Dr. Riek Machar, the Sudanese state radio reported Thursday. The announcement comes days after the duo signed a power-sharing deal in the Sudanese capital Khartoum aimed at ending a nearly five-year civil war that has seen tens of thousands killed and pushed millions into exile. “President Salva Kiir issued a presidential decree pardoning Dr. Riek Machar and other groups that took up arms against the government since 2013. The decree comes into effect on the date 8, August 2018,” State Radio Juba reported. 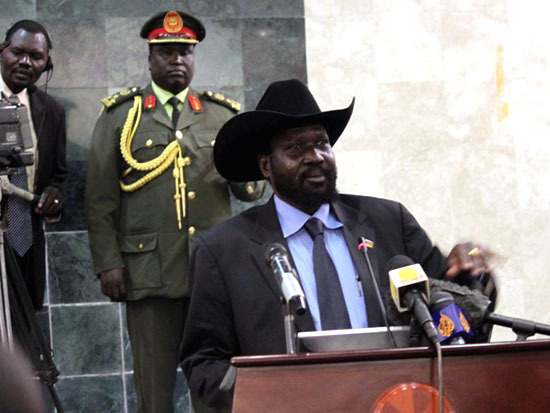 President Kiir reiterated a call for his forces to observe a ceasefire agreed in June by both the government and Machar’s rebel outfit, the SPLM – IO. Sunday’s power-sharing agreement paves way for Machar to return to South Sudan as one of five vice-presidents, a role he occupied until the conflict erupted in December 2013 when Kiir accused him of plotting a coup. The agreement also requires the warring factions to sign a final peace accord, under the auspices of regional bloc the Intergovernmental Authority on Development (IGAD), followed by the formation of a transitional government that will hold power for three years until elections can be organised. The last time a peace deal was signed returning Machar to the capital was in 2015, but the agreement collapsed when fresh fighting erupted in Juba forcing the rebel leader to flee into exile. On Monday businesses closed in South Sudan’s capital Juba as people celebrated the signing of a power-sharing deal. The series of discussions that led to signing of the peace agreement, started in May this year in Addis Ababa, Ethiopia and were called by the IGAD leaders, a seven-member regional bloc that has been facilitating the South Sudan peace talks since fighting first broke out in December 2013. President Yoweri Museveni recently said that he was hopeful for positive results.